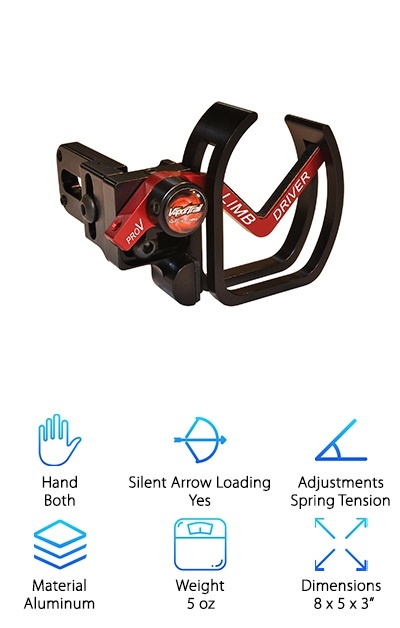 Hand - Are you looking for a left or right-handed arrow rest? To ensure that your rest and your bow are the perfect match, you’ll need to know what hand you plan to shoot with. Silent Arrow Loading - Silent arrow loading is how quietly you can nock your arrow. All arrow rests strive to be very quiet, but silent arrow rests make reloading your bow as quiet as possible. Adjustments - What adjustments does each rest offer? Some examples of different possible adjustments are Horizontal, Vertical, Overdraw, or perhaps a combination or even all of those. Material - What are the main materials of the bow rest? Some are made from all one material, but some can be made from a combination of materials working together for the best rest. Weight - We’ll let you know what each of these arrow rests weighs. Each of these will be measured in ounces. If you are not looking to add too much weight to your bow, check this stat. Dimensions - How big is each of the arrow rests? We’ll let you know the dimensions of each arrow rest in inches, so you can make sure that it isn’t too big, and it isn’t too small. Now that we have all of the icons out of the way, we’re just about ready to get to those reviews. We loved all of these arrow rests, but there were two of them that really stood out from the pack. We placed them first and second; the first is our number one Top Pick. It’s the rest we loved the best. The second is our Budget Pick, which is an inexpensive model that really stood out from the pack. If you’re in a hurry, you should check out these two. Now that we’re done with all that, let’s get to those reviews. 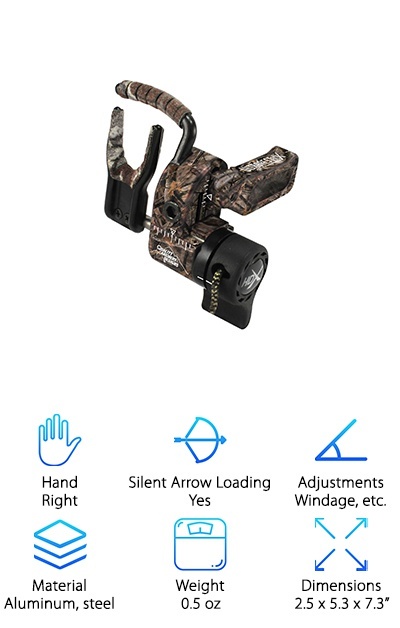 Our Top Pick is, in our opinion, the best hunting arrow rest around! The QAD Ultra-Rest HDX is a right-handed arrow rest with a noise reducing cut dampeners to ensure that every shot is as quiet as possible. This rest completely contains the arrow. It is made from quality CNC aluminum and stainless steel, cut and shaped with precision. The timing cord is easy to adjust, and the QAD Ultra-Rest HDX features a patented cam/brake feature that takes bounce back out the equation; it also allows for faster launcher drop away. It’s also painted in Mossy Oak Camo to help match your gear! It’s lightweight, user-friendly, durable, and full of great features. There are so many reasons why we called this the best arrow rest for hunting! 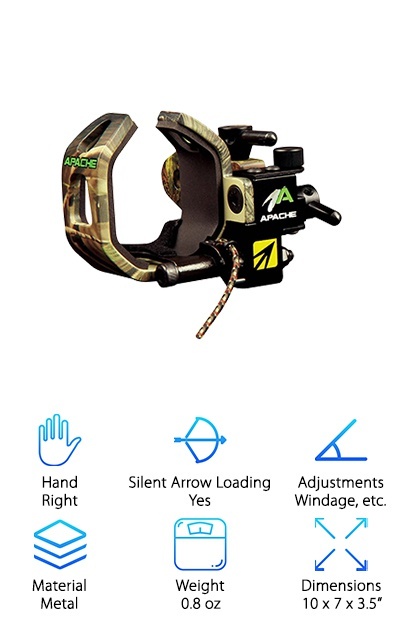 If you need an ambidextrous arrow rest with fully adjustable windage and elevation, our Budget Pick is a great rest to look at! 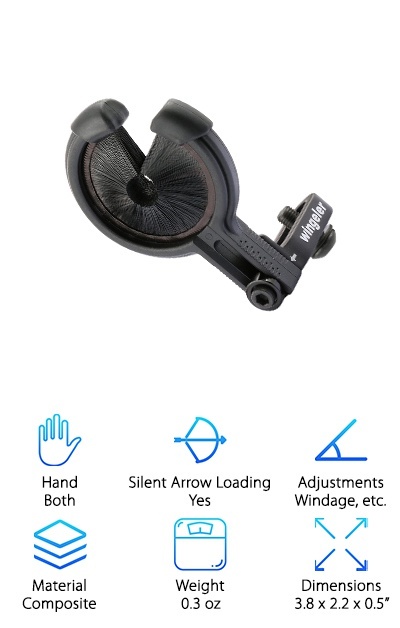 The Tabiger Arrow Rest is compatible for either hand. It holds onto the arrow securely. Its design helps to hold the arrow without interfering with, ruining, or catching on the arrow’s fletching. The biscuit is extremely strong and well-built, encased in a composite material that stands up to a lot of use. Although the best part of this arrow rest is the inexpensive price, the rubber boots come in a very close second! While you wouldn’t expect a budget model to take the extra step of making loading silent, this one has, adding custom rubber boots to stop the sound. All that without breaking the budget! We think the New Archery Drop Away is the world’s best drop away arrow rest! This thing is easy to install, quick to operate, and super quiet. All the things we love in an arrow rest! This rest is easy to adjust and doesn’t need any tools to do so. It even has laser graduations to make super fine tuning as simple as possible. The outer skin is a nice camouflage to match all of your hunting gear. It is built with unique, 360-degree sound suppression for a quiet fire load and a quiet fire; it will be difficult to hear you coming! And the best part is the all-metal construction. It makes for a very durable drop away arrow rest, which is good for rugged conditions! The Truglo Downdraft RT Xtra is another drop-away arrow rest that we just love! It is lightweight without giving up any durability. It is made entirely from metal coated in an attractive, Realtree camo pattern. It is truly high-performance and yet easy to install. The rest attaches quickly to the downward-moving buss cable, and it is quickly and easily adjusted to the perfect fit. 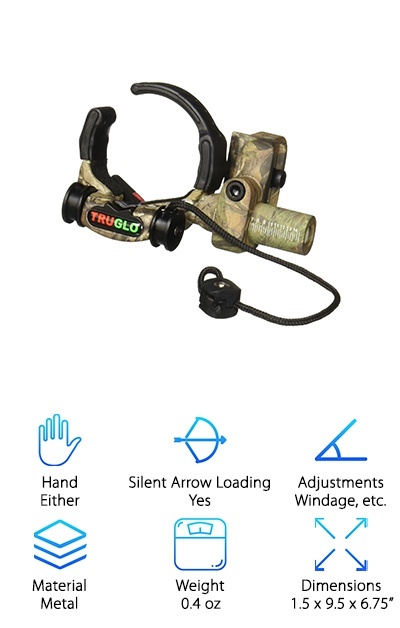 There are a couple of helpful installation videos on Truglo’s website as well if you have any questions about getting it just right. You don’t even need a bow press! The wonderful design helps to get rid of bounce back and noise through its awesome design. And the best part? The torsion spring that helps to enhance performance. So if you need a quick, easy, quality rest with high-quality parts and performance, check out the Truglo Downdraft RT Xtra! Want a whisker biscuit arrow rest that comes in tons of great colors? The Trophy Ridge Whisker Biscuit comes in seven colors: black, electric pink, green, orange, purple, yellow, and red. They are all bright and fun colors that will brighten up even the most dull-colored bows. It also comes in a variety of different size. The design perfect for either left- or right-handed users. The whisker biscuit is encased in durable composite to help protect your arrow rest. It is easily adjusted and installed to make sure that every shot is as perfect as possible. This arrow rest also features rubber boots to help dampen the sound of loading and firing. And we love how customizable these things are! Between the windage and elevation, color choices, and size choices, these are some of the most customizable arrow rests we’ve ever seen! The Hsakei Arrow Rest is an easy to install, whisker-biscuit-style arrow rest. We love it for how easily it is to adjust and how versatile it is. The windage and elevation marks are easy to read and simple to adjust, making getting the perfect shot even easier! This clever rest has reversible mount design to be easily switched between left and right hands. It also features rubber boots on the tips of the biscuit to help cut down on loading noise. And that isn’t all! This biscuit is encased in a tough-as-nails composite to help keep your rest looking and working like new for longer. Although it’s a little heavier than some of the other rests on this list, it is not so heavy that it will make a huge difference for most bowmen. And it more than makes up for it with improved accuracy and an incredibly low price! Want an amazingly lightweight arrow rest? The Wingeler Arrow Rest is a mere 0.3 ounces, making it one of the lightest arrow rests we’ve ever seen! It’s incredibly compact too; it’s smaller than most other whisker biscuit models without losing accuracy or durability. The biscuit is encased in composite material to help protect it, making it stronger without catching or damaging your fletching. It has easy windage and elevation adjustments with easy-to-read markers, and it features custom rubber boots that stop metal-on-metal contact for true loading sound dampening. You can use this with either left or right-handed bows, making it both versatile and user-friendly. So if you plan to take you bow hiking or camping and weight is a big factor in choosing your accessories, this awesome whisker biscuit is a great place to start! 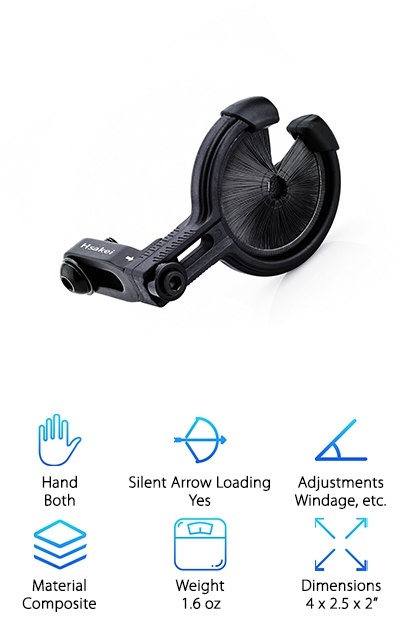 The Huele Archery Arrow Rest is a whisker biscuit with a unique design to help eliminate friction. The whiskers totally contain the arrow without damaging or catching on the arrows or fletching. The biscuit is wrapped in durable composite material to keep your rest protected while the bolt that connects this rest to the bow is made of a strong metal. The brushes are also made from a super durable material to help them last a long time as well! It works for both right- and left-handed users, and it comes in a matte black that matches most bows. The windage and elevation are easy to adjust with the same (included) wrench for quick adjustments. 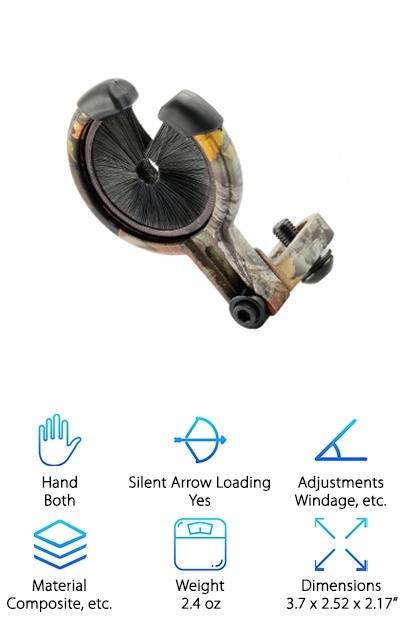 Whether you are looking for a great rest for practice, bow fishing, or hunting, the Huele Archery Arrow Rest is an awesome rest. We’re pretty sure you’ll love it as much as we do! Here’s another great drop-away arrow rest! The Quality Archery Hunter Rest features total arrow containment. It has an easily adjustable timing cord with a cable clamp to lock it in place. This is one of the few rests we’ve seen that also works with shorter arrows. It’s super lightweight at just 0.8 ounces. It has a great, breakaway safety feature as well as a full-draw indicator to ensure the perfect position for launch. 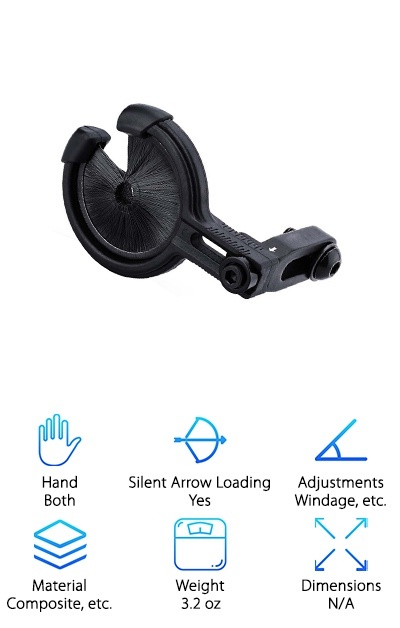 Made from precision-cut materials like aluminum, stainless steel, and Delrin, this is a long-lasting arrow rest made from quality parts. 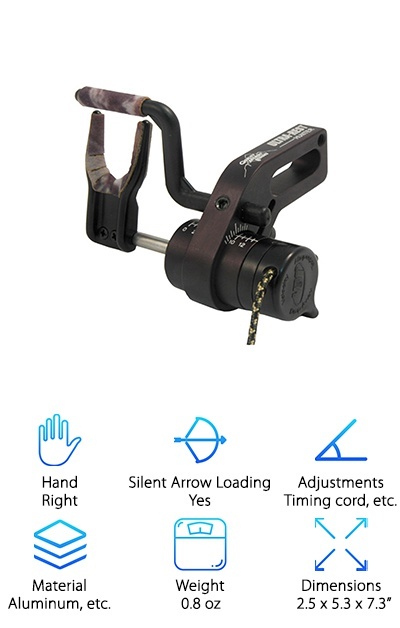 Here’s the best part though: this rest has a cool thumbwheel to allow for an easy, single-motion loading and capture that’s fast and accurate. We love this arrow rest for all of its sweet features, and we’re pretty sure you will too! Want something a little different? The Vapor Trail V Rest is a limb-driven arrow rest with full containment and complete fletching clearance. Although it looks a little different than some of the other rests on this list, the Vapor Trail V Rest is a great buy. 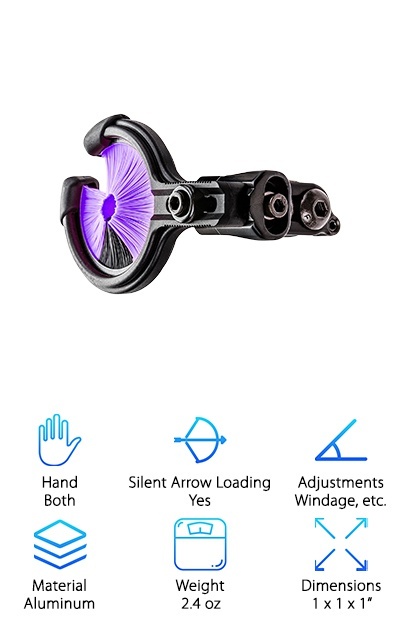 It features an adjustable spring tension and a free-floating launcher arm for fine-tuning performance, making it one of the most unique arrow rests on this list. It’s made of durable aluminum with rubber dampeners to quiet loading sound. But the Vapor Trail V Rest has something else we’ve never seen before: it supports the arrow for 70% of the shot cycle, adding to the accuracy and speed like nothing else we’ve ever come across. We love it for long-range shots and target practice!